Reinforce beginning sounds with your child with these Penguin Beginning Sounds Matching Cards! They also have a little of a Valentine-theme, so it’s just in time for Valentine’s Day! There are male and female penguin cards to match. The male penguin shows the letter, and the female penguin shows an image. Your child has to match the image to the beginning sound, and they’re done! It’s something they can work on repeatedly as a starter or a free time activity! 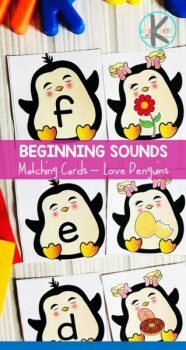 Check out these Penguin Beginning Sounds Matching Cards!